China's Historic Capital, and host of the 2008 Olympics! (Above) Our most recent visit to the Great Wall, packed with Olympic crowds in August 2008. Michael has loved history-rich Beijing ever since his first visit in 1985 (while studying in Xiamen 1985-86). He also taught here in 1987, at which time he lived in the Long Tan Hotel (below--though it has changed a lot since then!). 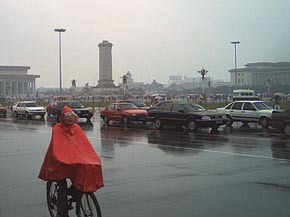 Michael returned to China in 1999 to teach in Tianjin for the summer, accompanied by six-year-old Andrew. Because an old friend lived in nearby Beijing, the duo visited twice, and then introduced Vivian to the city before returning to the US for a year. 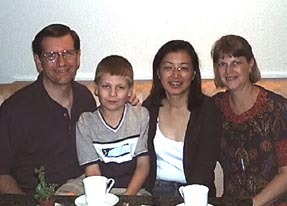 We all moved to Shanghai in 2000, lived in Xi'an from 2002 to 2005, and now live in Kunming. 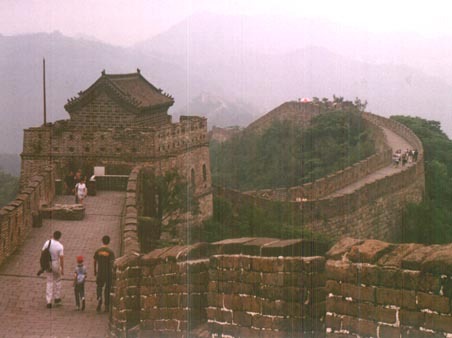 (Left) Little Andrew walks with friends on the Great Wall just outside Beijing, July 1999. 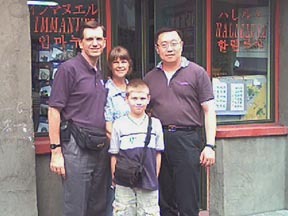 In 2003 we visited Beijing for two short days. Unfortunately, it rained the morning we went sight-seeing. Nonetheless, it was nice to see familiar places like the Forbidden City and Tian-an-men Square (below--with Chairman Mao's Mausoleum in the center, and an ancient gate in the background). Michael's 1987 home is the red hotel in the background. In 2003 our family also spent a few hours at an amusement park next to Long Tan (below). Tian-an-men Square runs between Mao's mausoleum (on the left), past the memorial to the People's heroes, to the Forbidden City. 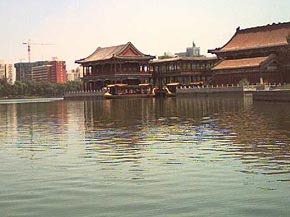 The National Museum is behind us, and the Great Hall of the People (i.e., congress) is on the right of this photo. 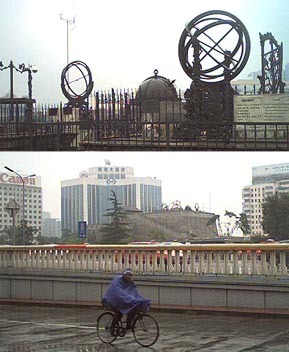 (Right) Jesuits helped build the Ancient Beijing Observatory in A.D. 1442. Many of the astronomical instruments on top date back to the 1600's. The main reason for our 2003 visit was to see two of Michael's long-time friends. Jimmy (in the left photo) was his best friend at Xiamen University (1985), and the pair traveled together to such exciting places as Huang Shan (Yellow Mountain) and China's biggest waterfall in Guizhou. (Above, Lei is also next to Andrew on the Great Wall.) 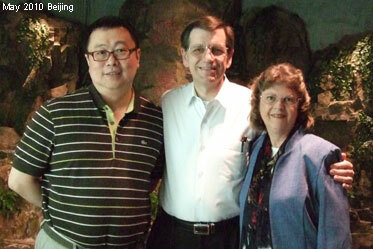 Holly (in the right photo) was the tour guide for Michael's first trip to Beijing (along with his parents in 1985). She also helped him find his Beijing teaching position in 1987, and her family was Michael's second home during that semester. Holly and her husband Gary now live in San Francisco, but we arranged for our paths to cross while she was visiting her family. 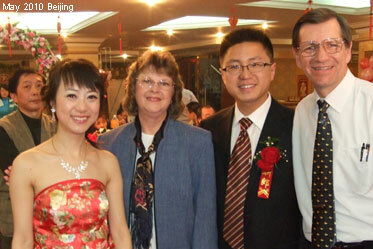 Below, we are with Lei again in 2010, but the main reason for that trip was to participate in the wedding of Helen Yang, Michael's former NPU student!  Click here to see our photos from the Beijing Olympics, 2008. Click here to return to the photo index.